Dinne loose in Radha's camp. It was but an hour before Dinne received new orders. Enrage the warlord, Lashrac told him. Cripple her 'host. Kill as many leaders as you can and wound her if you're able. Above all, kill the boy. You must stoke the Keldon's fury until she's ready to lash out at anything and everyone. Dinne passes Dassene and heads on into the tent undetected. Inside was something truly bizarre. It was soft and boneless, a grayish-white lump of muscle with deep, blue veins throbbing along its outer surface. It shifted like a bag of melting ice, and the veins pumped so that the entire mass shuddered as it compressed and expanded like a clenching fist. A deep, sonorous sound accompanied the ghastly rhythm, a booming, percussive beat that shook the ground and sent soft vibrations up through the soles of Dinne's feet. It emanates intense cold, one that sent a painful chill through his fingers when he reaches out for it. Whatever it is, it is powerful. Also in the tent is the lizard warrior and the boy he was meant to kill, apparently blind. The lizard warrior looks worthy of killing. He would prefer to show himself and watch the warrior in action, but he is a soldier first and won't risk an alarm being sounded. He draws one of his throwing spikes, ready to kill, but the blind boy points straight at him and warns the lizard, Skive , of an intruder. He throws one spike, and then another, but it's too late and the lizard dodges. He tried to do this quietly but that isn't an option anymore, so Dinne decides to have some fun and show himself. The lizard is quick and lashes out with his tail, but it Dinne lets it harmlessly pass through him. The assassin is trilled to fight such a valiant creature. Even after two spikes are driven through its shoulders and cannot move its arms, it still fights on. 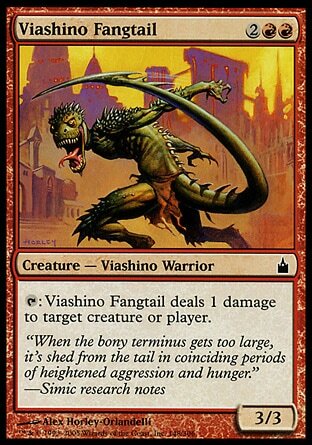 Dinne stabs more spikes into his spine, and one to pin his tail to the ground. And then fades out in time for a blast of fire to pass through his body. The fire is magical and is able to burn him a little despite his incorporeal state and he relishes in the pain. But he has a job to do. The boy has to die. So he leaves the fire mage alone and remains invisible as he advances on the boy. Blind as he is his, he has a power that allows him to see Dinne and the boy never takes his eyes off of him. When Dinne gets close, the boy surprises him and drives a dagger up through his chin. He's shocked as an icy pain cuts through him and he feels as if he's drowning in his own blood. Dinne takes a step back and realizes he's okay. He also realizes that somehow the boy was channeling the energy from the... thing... in the center of the tent. The thing however is too big to destroy or steal. This has to end quickly. Dinne solidifies, throws a spike towards the fire woman, then rams two spikes through the boy's ribcage. He fades from view before the woman can get a clear blast at him and he maneuvers his way to the exit. Then a magical sword impales him from behind. The Keldon woman doesn't stop there. She uses a foot to push him off the blade, and with no energy to fade out again, she stabs him over and over again. This should be it, but his master decides he's done enough damage. Despite being told his work here was done, he tries to implant the rage on the elf's face in his mind. He would come back for her. Jeska makes it clear that the assassin wasn't her doing. Radha doesn't much care and still lays blame at Jeska's feet. Even if she wasn't directly involved, she was still a distraction that kept her from arriving sooner. Radha orders Dassene to keep the newcomer out the tent while she attempts to save the blind boy and Skive. Jeska is impressed with the Ghitu woman who has given her loyalty to her warlord, but seems to have more control over herself. 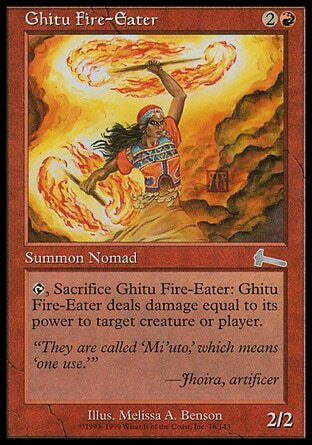 When Radha emerges from the tent and Dassene is ordered to summon the 'host, the Ghitu woman is able to quickly and efficiently deliver her commands with a few looks, nods, and hand motions. 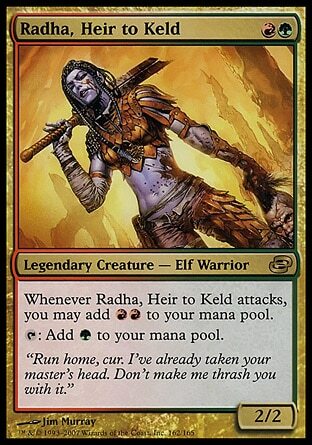 But as for Radha, she surprises the planeswalker with an uppercut backed by magical energy that sends her flying across the camp. Jeska lets Radha have the win. There is no convincing her of anything. This confrontation of theirs will have to come to a duel, and allowing her warriors to witness this now will make Radha's downfall all the more dramatic. 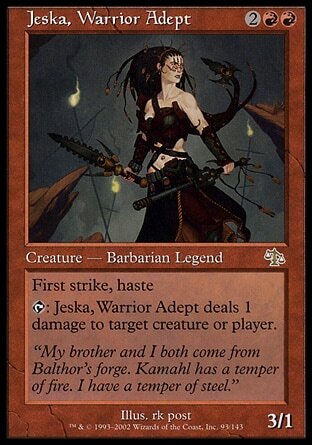 Jeska was a pit fighter once and is no stranger to the spectacle of combat. I actually thought he was going to die when Radha has him. I began thinking that maybe that's why he was given that extra scene in Planar Chaos. This would really be his second fight on screen. The first was a successful stalking and kill, the second would be his failure and death, with the scene with Teferi observing him to fill out a trilogy of Dinne chapters. I'm glad he's not dead though. I want to see what becomes of him as he acquires more and more of his sense of self. Will this assassin come to a point where he no longer wants to just be the loyal solider and will give in to his cravings? 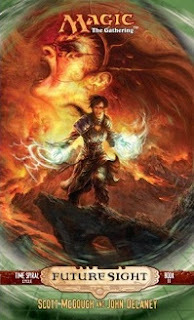 In Book One Radha was a novice when it came to the Keldon way of life and nature of spectacle when it came to battle. We'll see what's she's learned once barbarian and pit fighter face off! He probably doesn't have a name. (He didn't have one back in Time Spiral.) Or if he does, Radha doesn't seem like they type to care.